Eris Parfums has launched Mx., a unisex woody animalic fragrance. Mx. is named for the gender neutral title. Starting with a sparkling mix of ginger, saffron and black pepper, on a bed of creamy cedar and sandalwood, Mx. adds the richness of Venezuelan cacao, the freshness of vetiver, and the animalic purr of castoreum. Mx. was developed by perfumer Antoine Lie. Additional notes include olibanum, patchouli, benzoin and birch tar. 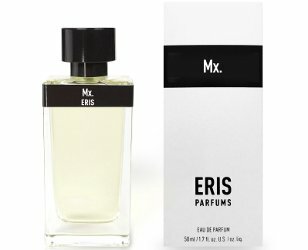 Eris Parfums Mx. is available in 50 ml Eau de Parfum, $150. This is exciting news. Especially since the launch is so well-timed to coincide with fall/winter perfume season. I’ll be getting out Ma Bête again, too. Lots of lovely notes there! Castoreum and birch tar make it sound quite learhery. I still haven’t smelled any Eris scents, even though I looked forward to their release for a long time. I put it down to a VISA problem. Oh! I had the pleasure of smelling this last year, it is WONDERFUL stuff. Reminds me a lot of Tom of Finland (also by Antoine Lie), but warmer and creamier. I wonder if it’s the cacao that takes these notes in a creamy direction. Can’t wait to try it!